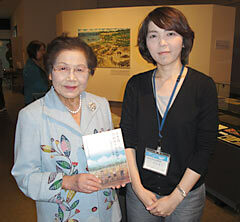 At the Himeyuri Peace Museum in Itoman, together with the guide, Akiko Nakada, the director of the museum, Yoshiko Shimabukuro (left) holds up a copy of the new book. The new book consists of the personal notes of 24 students. They are divided into two categories: “The path from the internment camp to home,” and “Looking for the remains of friends.” The book was edited to be easy to read, and includes some notes written by the museum curators as well as some old pictures. Hisa Tsuhako wrote about her experience of being captured after the dissolution order and taking care of orphans at Hyakuna in Tamagusuku. Her story explains how when a typhoon hit Okinawa after the war, children thought that the war had started over again, and she had to carry them and find shelter while they were crying out their parents for help. Fumiko Higa wrote about finding the remains of her friends at Odo beach in Itoman. She wrote about a heartrending scene in which bereaved families collected stones instead of bones, placing them in an urn and talking to them, saying, “Let’s go home,” as though they were their lost family members. At the museum, the exhibition Himeyuri Students who Survived will continue until March 31 next year. A guide at the museum, Akiko Nakada says, “We thought that it would be important to tell the untold stories about students’ lives after the war and about the period until this museum was created.” The book can be purchased at the museum for 1500 yen.